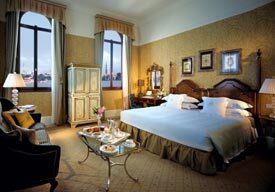 ABOVE: A deluxe double with a view of Giudecca and San Marco. INSET: Canale Rezzo at sunset, marble bathroom in room 334. 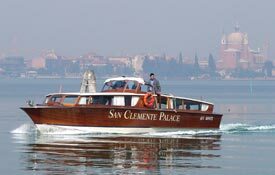 The San Clemente Palace has 205 guest rooms, including 89 junior or classic suites. 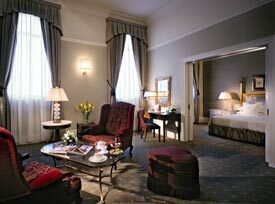 All are spacious by Venetian standards, with ceilings that are more than 4 meters or 13 feet high. Even the corridors are oversize, with big windows overlooking a landscaped courtyard. My son and I stayed in room 334, which was similar to the room in the photo above. The room had large twin beds, a sofa, and two windows that looked down on the square in front of the 12th Century Church of San Clemente and the lagoon. Beyond the small boat dock at the edge of the square was the Canale Rezzo boat channel, where we could see the San Clemente Palace's shuttle boat, delivery barges, work boats, Venetian oarsmen, and other lagoon traffic. In the distance were the island of Giudecca and, just beyond, the Piazza San Marco. Our marble-tiled bathroom was luxurious, with a separate glass-doored shower stall next to the full-size bathtub and across from the toilet and bidet. It had an illuminated shaving mirror and a switchable 120/240v outlet for electric razors. During our visit, we had a chance to visit one of the hotel's classic suites, which had an entrance foyer, a big living room with sofa and chairs, a separate bedroom reached through sliding doors, a huge walk-in closet, and a bathroom with a separate room for the WC. We also saw the Presidential Suite, a two-level apartment that featured a living room with fireplace and plasma TV, an office/den, a dining or meeting area, a sleeping loft with antique ceiling beams, a dressing room, and a large bathroom. Like other accommodations in the San Clemente Palace, the suite was richly decorated without being over the top.